Free cash to choose live treasures, the highest income of 3.47% |The opportunity for the banking sector is here? Leveraged funds prefer short-term hot stocks Can the A-share "backbone" hold up the market? topic | This industry enters the fast lane This type of stock callback is the golden pit. Who is the next Chinese ship? After watching the military parade at sea, you can look at the military stocks. Financial management |Can't pay a penny to buy a car of 280,000? Someone bought a car and something went wrong. Half of the fund shares of the Huaxia Fund have shrunk in the first quarter. International oil prices have risen by more than 2%. Will the domestic price adjustment of refined oil products rise or fall next time? Bond |The default rate of private enterprise bonds reached 5.1% in the first quarter. The big bulls crossing the bulls and bears Guizhou Moutai only ranks third in the list! The size of the QR code industry is expected to exceed 1 trillion. 4 stocks are put on the buy and increase label. futures |U.S. cuts Iran’s crude oil exports. The reporter asked the Chinese side how to do it four times. Foreign exchange |The Fed began to discuss how the interest rate cuts affect the Chinese market? 152 questions! The three families of the board accepted the company was "soul torture"
The differentiation of the northeast property market: the provincial capital will stabilize Dandong's rise. Hegang is now "cabbage price"
Under the science and technology network, the new requirements for private placement must exceed 1 billion yuan. The former private equity champion was filed! Xinhua Department Store's equity battle will be seen? In the first quarter, the total new tax reduction was 341.1 billion yuan, and the tax revenue decreased by 29.6%. Another deputy governor insider trading was dismissed. Stocks earned 160 million yuan and were sentenced to 20 years! The counter local debt that once sold out in ten minutes has now fallen below 100 yuan. Zhongtai Securities: A large inventory of the national population mobility map Where is the next “Hegang”? Yang Delong: Most fund issuance is still tepid. It is still in the early stage of the bull market. Haitong Macro Jiang Chao: After the tax reduction policy is put on, how will future inflation go? CITIC Securities: The effectiveness of the wide credit policy has already appeared. Where does the amount of credit flow go? Whether the comedian is elected as the president of Ukraine is capable of being qualified as a "public servant"
The Fed’s governing hawks’ candidates are reluctant to leave. The other candidate is also fierce! Fed officials began to discuss how the interest rate cuts affect the Chinese market? Will Russia continue to “stop” the US dollar or become an unreliable currency? Shareholders are "stunned"! A shares are the worst today: one day, eating "three downs", it actually did it, and that the convertible bond plummeted. The girl asked for money to record the exposure. Liu Qiangdong said that the content is true. Meizhou Regal is a strong placard! The major shareholder Weibo shouted 340,000 shareholders. Stock price two daily limit. Shanghai Stock Exchange lightning inquiry! Shanghai Ruitong is coming? The Shanghai Stock Exchange and the Swiss Exchange will sign a memorandum of understanding on cooperation or exchange CDRs in a few months. Xinhua News Agency: How to look at the future development of the real estate market? The deputy governor of the "share god" was sentenced to 20 years of insider trading and earned 160 million! Before falling, my wife poured hundreds of thousands of wine into the sewer. 3200 points lost in 20 days! The net outflow of funds to the north is 6 billion. The market is extremely divided. What about a good bull market? Ma Yun: Tencent is not the opponent that Ali wants to defeat. It is the partner who creates value for the society. Liu Qiangdong's case has not been edited. Video details: Ladies' jackets. Selling 90 million cups a year and losing 1.6 billion. Will Ruisheng, who is about to go public, really surpass Starbucks? The first batch of inquiries from the Science and Technology Board came back! The Shanghai Stock Exchange asked a total of 152 questions. 3 companies responded with 500,000 words! Zhongtai Securities: National Population Flow Counting Where is the next “Hegang”? [Discussion] In the afternoon, you will fall back. Are you still optimistic about the market outlook of brokerage stocks? [Discussion] What is the reason for the Shanghai Free Trade Zone's strength against the market? Share it | The central bank rumors revealed the signal Is Wednesday a chance to bargain? Blog | Peripheral general increase Can the stop signal be clear again? The shock trend will not end The market will be comfortable today. After the tide of the fall, it is often the emotional repair market The index can be adjusted to the bottom. Just take Luo Niushan as a pig now. Ma Xian does not have to consider. 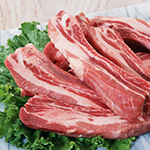 The price increase of pork does not cause too much increase in order to maintain local consumption. Baosteel :Dear Investor: Except for special instructions, the company's futures products are not subject to tax. In the first quarter, the scale of public offerings was hit hard, and the scale of the increase was more than 800 billion. The first batch of 7 Science and Technology Funds were officially approved and 75 funds were under review. The fund's second-quarter operation direction is clear. Focus on consumption upgrade and technological innovation. Fund perspective |Four factors lead to adjustment. The foundation of the stock market long cattle has been built. What do you think will be the trend of the market on Wednesday (April 24)? market |Financing balance is almost equal to one trillion yuan. Leveraged funds prefer hot stocks. Can the Shanghai Stock Index's 20-day moving average be able to keep it? Can the A-share spine support the market? In the 20 days, the Shanghai Composite Index fell 3,200 times in the market, and the market suggested avoiding excessively large varieties. Individual stocks |Two types of institutions appear in 22 companies and hold 4 shares in five quarters. The number of open-issue companies to be increased to five. Underwriters are facing high risks and high returns. The company’s finance chief resigned. The company’s net profit fell 1575% year-on-year. 45 new three board companies reported first-quarter results, but four still could not disclose on time. Famous |Liu Sishan: The stock index fluctuates widely and the market risk is gradually released. Zhongtai Securities: A large inventory of the national population mobility map Where is the next Hegang? Jiangsu Lianrui New Material Co., Ltd. Inquired Dongguan Securities Co., Ltd.
Hangzhou Anheng Information Technology Co., Ltd. Inquired Guotai Junan Securities Co., Ltd.
Can Ruixing Coffee rely on the “burning money subsidy” to allow the employers to continue to pay? futures |Pig concept stocks continue to trade. Stock futures "two hands"
Foreign exchange |The market continues to be bullish on the dollar. The Fed’s doves have little influence. Financial management |The first quarter profit exceeded 600 billion, and the public fundraiser played a beautiful turnaround. Hebei Langfang strictly investigates the behavior of housing prices. A number of illegal real estate agents were cleared. Happy twist, a brother, sinking nearly 100 million yuan, the income is exposed. China Life’s premiums in the first quarter increased by 11.9%, and the old rival Ping An Life Insurance was nearly 80 billion. It is the gene that is more open and driven. CITIC Bank has laid out the financial silk road. Bond |In the first quarter, the Shanghai Stock Exchange issued various types of bonds of 1.15 trillion yuan. These five people are really not suitable for being friends. If you have never been to these cities in this life, it is really a regret for a lifetime! Get up in the morning, do you exercise or eat breakfast first? I finally got the answer after reading it. Guts determine wealth! The sentences are classic! China's wealthiest city, per capita GDP exceeds Singapore, but there is no town. In the "Dream of Red Mansions", Jia Jia is not okay to organize a party. More than half of the world's "most harmonious" countries are Chinese. The economic development is also very good.